Welcome to our friendly, family-owned New Mexico guest ranch! 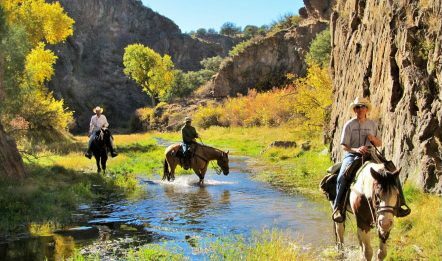 You’ll find Geronimo Trail Guest Ranch tucked away in southwest New Mexico, in the heart of the 3.3-million-acre Gila National Forest. Here, the mountains are boundless, and the open meadows and deep canyons with crystal clear spring-fed creeks are enough to soothe even the busiest of minds. 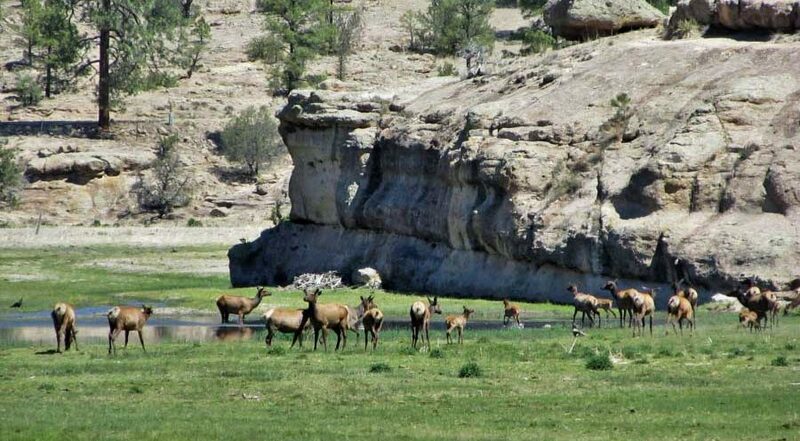 We offer a relaxed and personal atmosphere: our dude ranch has four cabins and a capacity of 12 to 16 guests. We are open from March through mid-November. With beautiful temperate weather, it is always the perfect time to pack your bags, saddle up, and experience an authentic New Mexico dude ranch. 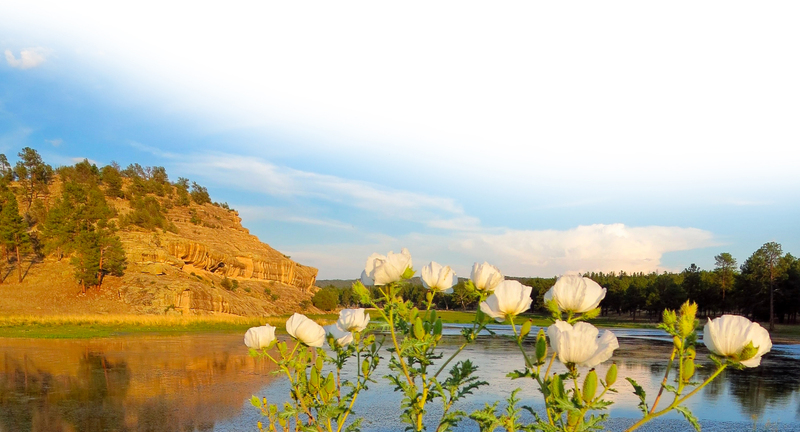 Immerse yourself in history when you stay at Geronimo Trail Guest Ranch! 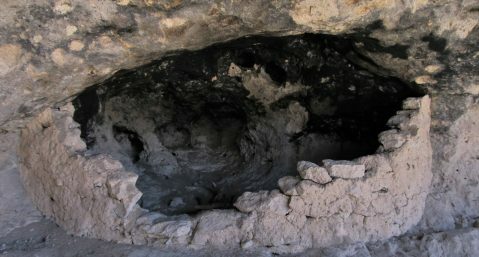 Take a step back in time and discover pit houses, cliff dwellings, pottery shards, pictographs, and countless artifacts. 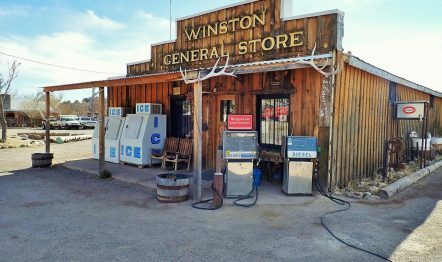 Learn about our guest ranch’s namesake, the famous Apache warrior Geronimo, as well as Basque Sheepherders and tin mining. New Mexico’s history is full of excitement and mystery, and we can’t wait to share it all with you! There are few places in the world where you can take in endless, pristine views of mountains, canyons, and lush landscapes. 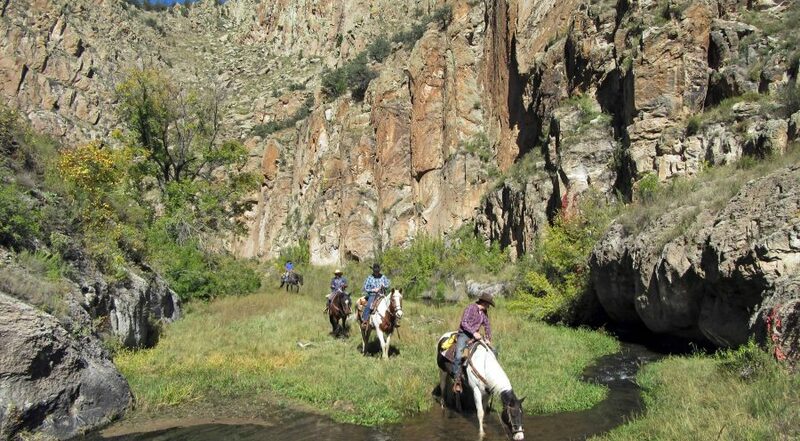 At our New Mexico dude ranch, Mother Nature flourishes and the varied terrain beckons all to explore. 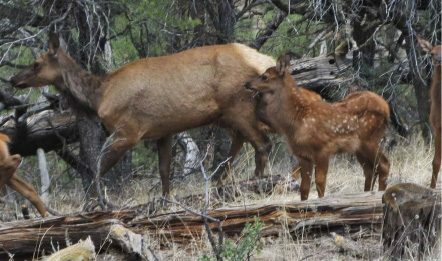 The Gila National Forest is famous for its breathtaking beauty, and each season offers an opportunity to experience the land from a unique perspective. 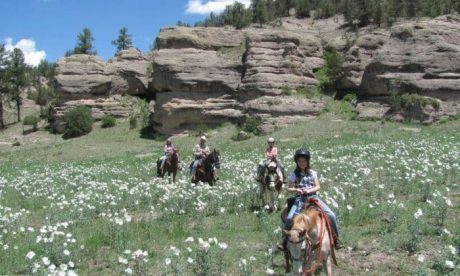 When you stay at on Geronimo Trail Guest Ranch, you can always look forward to New Mexico horseback riding at its best! 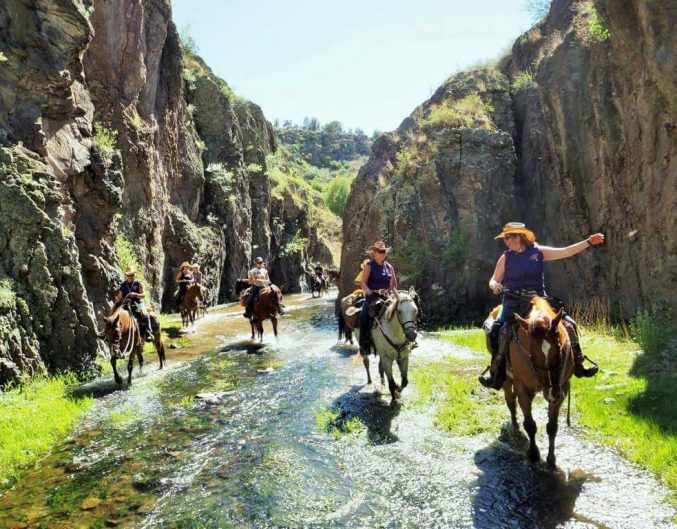 Experience the Gila National Forest the way it was always meant to be seen, by trail riding on a horseback tour. Ride as little or as much as you please! We have millions of acres to explore, so read on to learn more about our riding trails, and get to know our beautiful, well-trained horses who will take you there. 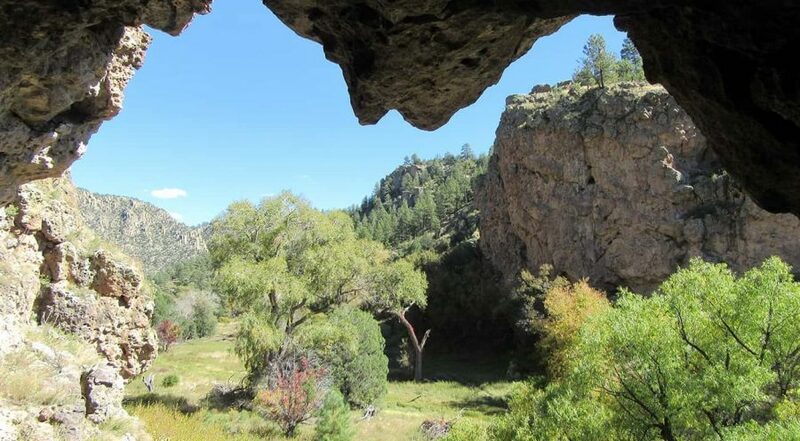 Situated in seclusion in the breathtaking 3.3 million acre Gila National Forest, Geronimo Trail Guest Ranch offers you the perfect spot to slow down, relax and reconnect with nature and each other. 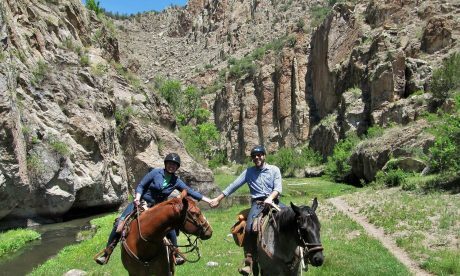 Geronimo Trail Guest Ranch is a perfect spot to reconnect with those you love for a fun-filled New Mexico family vacation or a small reunion. Rides are adjustable depending on what you want to do and how much you want to ride. We offer half day rides and we also love taking all day picnic rides as that allows us to explore farther away from the ranch and see more! Outlaw is decorated in western style. It has two separate bedrooms with a Queen bed in one room and one set of Bunk Beds in the other. It can sleep up to 4 guests. Mimbres is decorated in horses and Native American style. It features a Queen bed and one set of Bunk Beds and can sleep up to 4 people. Apache is decorated with a southwest/Native American theme. It features a Queen bed and a Twin and can sleep up to 3 people. 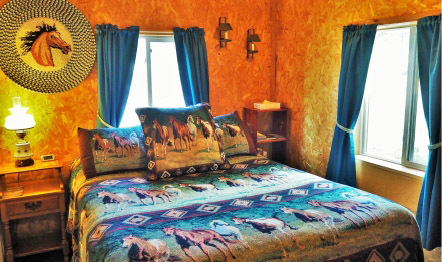 Cowboy is decorated with a cowboy and horses theme and is our largest cabin. It features one Queen bed and three Twins and can sleep up to 5 people.